My initial plans for where I would be fishing this weekend were scuppered by a fault of my own doing. A careful inspection of the Leeds ASA handbook clearly says a key is needed to access the bolted gate of Sandwath Lake. But in my excitement to leave I had hastily over looked this point and arrived at the lake thoroughly perplexed and slightly frustrated. After speaking to an Angler leaving the lake I discovered that a key was needed and there was no way I would be fishing that lake on this day. So after 10 minutes, a minor melt down and with the help of Google I found that Birkin Fisheries wasn’t that far away and that a few hours fishing was better than no hours fishing. Arriving at the lake after driving through Birkin at least twice (it was turning out to be one of those days), I was quite surprised at the 2 lakes in front of me. One of them, quite small and with two small islands, and the other, a large oval shaped lake with 50+ comfortable wooden pegs with a large island running the entire length of the lake which gave the appearance more of a river or canal venue than that of a lake. I unpacked my gear and after a quick look around I decided to fish the larger lake on the Pole. As we are still coming out of winter there was very little plant life growing. But every so often you could see the remnants of last year’s growth, and finding a peg with this as a feature I began setting up. The shape of the lake lends itself to the pole angler and I found that 11.5 meters was just enough that with a short swing of my rig I could place my bait within millimetres of the opposite back. Having the afternoon to fish I decided my first line of attack was going to be maggots, fished at around mid depth (approx 2 ½ feet) and depending how that went, change tactics for some of the larger residents that the lake held. Shipping out double red maggots, the float whipped under before my bait had reached its depth! They were taking on the drop. Pulling the little Golden Rudd in and shipping back out with fresh hook bait confirmed this thought. 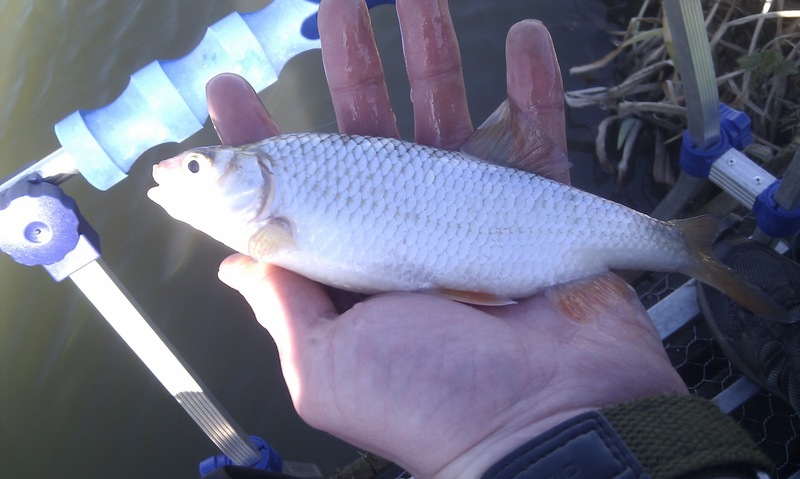 Within half an hour of fishing I had caught 20+ fish ranging from Rudd of 2 – 3 oz’s to Ide up to 10ozs. This was starting to be a very productive afternoon. I kept these tactics up for another 20 minutes while I began to feed a second swim. The loose feed being cupped in was pellets soaked in liquid pineapple with a few pieces of corn and meat. Using corn at first I placed my bait just shy of the reeds on the opposite bank, swinging my rig towards me before dropping it into the water (the anglers around me were talking of a ledge so I tried to position my bait on the slope of this ledge). A slightly longer wait, but the float zipped away and a skimmer of a few ounces found its way into my net. This was followed by a succession of Skimmers and Ide, in fin perfect condition up to around 12 ounces. Satisfied that corn wouldn’t produce the better fish on this day I switched to meat. Having fed rough square chunks, I hooked a cylindrically punched 8mm piece (hoping that they would take something slightly different) and shipped out. 5 minutes past and although I had plenty of line bites nothing happened. Repositioning the bait closer to the reeds my float ripped under and striking I felt that this was no Ide or Skimmer. Pulling hard to the left to prevent the fish burying into the reed bank opposite the hook pulled! Disaster! Still, they were on the feed and after balling in two golf ball sized lumps of feed I was back out there waiting for another. The meat barely settled on the bottom when my float vanished and my pole curled round, the fish went off like a train! The elastic rocketed out of my pole and I was left holding what was certainly the biggest fish of the day. After playing the fish for 5 minutes and finally bringing it to the net what followed must have appeared to anyone watching as a comedy of errors. The fish broke the surface, took its first gulp of air and it was beaten. I place my landing net under it and in the process got the elastic holding the disgorger around my neck caught between my pole section and the landing net handle. Pulling the landing net with fish into the bank (whilst being semi throttled by my disgorger) I heard a disturbing crackling noise from the screw section of my landing net handle. On lifting the net and fish out of the water the crackling noise was preceded by a gunshot like “crack” and my landing net and fish found their way back into the water! This presented a problem. Thinking quickly I gripped my top 3 before the fish made a run for it (it was now fully recharged and still attached). I used the remaining sections of my landing net handle to quickly fish out my net which was slowly sinking! It was at this point that one of the anglers to my left had seen this shambles of a 5 minutes and arrived with his landing net. 2 – 3 minutes later and the fish was on the bank. 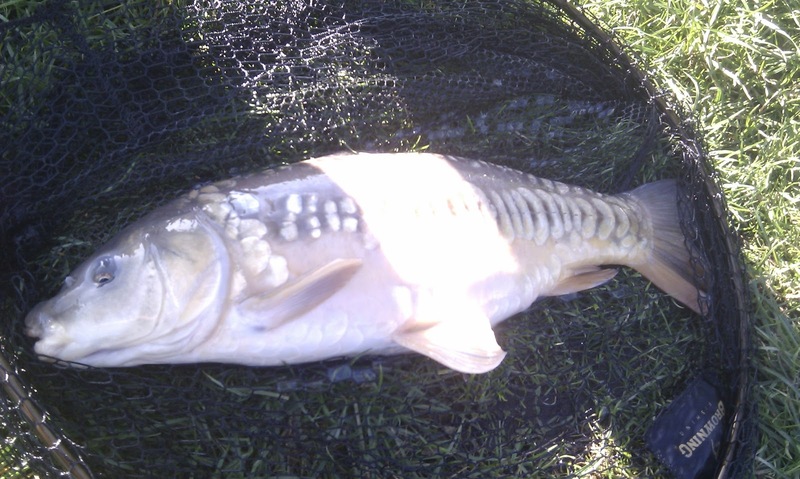 A lovely Mirror carp weighing roughly 5-6 lbs (guestimated by the angler who netted it, I thought bigger). Slipping the fish back into water I was left with a problem. No landing net handle. Another angler from my left now offered me his spare and I accepted being very thankful that the guys around me were incredibly generous. Balling in some loose feed I shipped back out with another piece of meat and began to wait, hoping that the last 10 minutes hadn’t scared every fish in the lake! A few minutes followed but soon my float began to bob on the surface again. It slipped away under the surface and again the elastic zipped into the water. Not as big as the previous fish, but a nice Mirror Carp just over 2lb’s found its way to the net. Switching between the square chunks and the meat cylinders, it was clear that the cylinders were catching the fish only having one bite off the cubes. I fished using this bait for the next hour or so and even managed to net my first tinca of the year. A fish of just over 3 quarters of a pound. Listening to the anglers around me, apparently the bream were back on the feed, so with that in mind I switched from meat to some sweetcorn and shipped back out, hoping for some nice skimmers to round off an eventful day. Sure enough within minutes my float had buried and I was bringing in skimmers all around the half a pound mark. I finished the day with a fin perfect fish of around that weight. So what did I learn about today’s session? Never buy a Landing net handle off Ebay, small punched cylinders of meat work better than cubes on commercial fisheries and Birkin Fishery is an excellent venue for a morning, afternoon or full days sport. With the angler to my right stating that he must have caught at least 40lb’s of Roach there are a lot of fish to be caught. I would guess all told, I finished after just 4 hours with a weight of over 20lb’s, which despite the earlier mishap I was very pleased with. What’s more, all this fun was had at the more than reasonable cost of £5. So I would certainly recommend the venue to anyone looking for a busy, fish filled day. My only reservations about the venue would be don’t count on the loo being open, in today’s case it was locked all day, and make sure you know where it is before you set off. Otherwise you may spending a little while using Google Maps finding the place like I did! i have just shown the old guy (pete) your photo of us all fishing and the write up you have done on your days fishing he is pleased as punch. hope you have many more great days fishing at birkin . Rob, thanks once again for netting that fish with me. I've gone back to using my old and more sturdy landing net handle now. Thank Pete for letting me borrow his spare handle, without it my afternoon would have been cut very short! I'll definitely be paying Birkin another visit when the summer kicks in, and will hopefully catch some more of those hard fighting carp! Hope to bump in to you there or any of the other fisheries around Yorkshire! hello, I am just wondering do you have matches on a sunday as I am coming to birkin fishery this sunday and I been told you have matches on?? It wouldn't surprise me if there were matches on up there. It probably puts out good weights. I'm not sure if it's a regular match lake though. I think there is a number to ring on the hut where you park up. Sorry I can't be of more help.